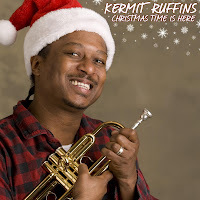 Kermit Ruffins just released a single, “Christmas Time Is Here”. It is a tease for a full length Christmas record coming in late 2009. Pick it up on your favorite digital platform, or order it online from https://www.basinstreetrecords.com/. With a hole punched in the corner of the cardboard sleeve, the sleeve will make a perfect Christmas tree ornament too. Catch Kermit on December 19th at his Birthday Bash at the House of Blues in New Orleans.